Robots test their own world wide web, dubbed RoboEarth « Adafruit Industries – Makers, hackers, artists, designers and engineers! According to BBC News, robots could soon be sharing information with each other over their own world wide web. A world wide web for robots to learn from each other and share information is being shown off for the first time. 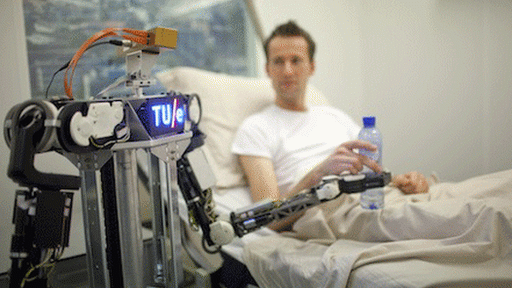 Scientists behind RoboEarth will put it through its paces at Eindhoven University in a mocked-up hospital room. Four robots will use the system to complete a series of tasks, including serving drinks to patients. It is the culmination of a four-year project, funded by the European Union. The eventual aim is that both robots and humans will be able to upload information to the cloud-based database, which would act as a kind of common brain for machines. One robot will upload a map of the room so that others can find their way around it, others will attempt to serve drinks to patients. “The problem right now is that robots are often developed specifically for one task,” he said. The aim of the system is to create a kind of ever-changing common brain for robots. “A task like opening a box of pills can be shared on RoboEarth, so other robots can also do it without having to be programmed for that specific type of box,” he added.